After returning to college I discovered that coffee was my friend, especially if I had a paper to write or a book to read. It wasn’t long before caramel lattes became my usual drink. I loved the buttery sweetness with a subtle espresso aftertaste. I had friends who were black coffee purists, but I wasn’t trying to prove anything. Everything changed when I walked into Intelligentsia. I was visiting Chicago with a big group of friends. We packed out a hotel room, 3 to a bed, and quoted Sufjan Stevens lyrics between visits to art museums and ethnic restaurants we found on Yelp. It was a bitter cold January, so it didn’t take much walking around before we were ready to find some respite from the cold. After shooting some obligatory photos of the Bean in Millennium Park, we ducked over to the nearest Intelligentsia to warm our bones. “I’ll have a caramel latte,” I told the impossibly cool barista. He hesitated, and grimaced like he was the bearer of bad news. My heart sank, but I didn’t want to lose face in front of this big-city hipster. “I guess I’ll just have a latte.” I said, trying to sound like I knew what I was doing. A few minutes later I was holding a white Vertex mug with an impeccable rosetta gracing the foam on top. I navigated the post-industrial interior back to our table. My friends admired the latte art. I took a sip, nervous but determined to blend in with the no-nonsense Chicagoans that filled the busy cafe. No matter how bitter, I was going to drink this cup to the dregs. But the latte was far from bitter. It was sweet with nuances of baking cocoa, featuring a balance of flavor that I would have never noticed with a sugary syrup. I had the sudden realization that this was the best cup of coffee I had ever had before- but it was only later that I realized there was no going back. That latte set off a chain reaction that eventually led to me preferring straight espresso, traditional cappuccinos, and black filter coffee. Little did I know that I would later spend most of my vacation time, and a solid chunk of my paycheck, trekking around the world in search of the best coffee. 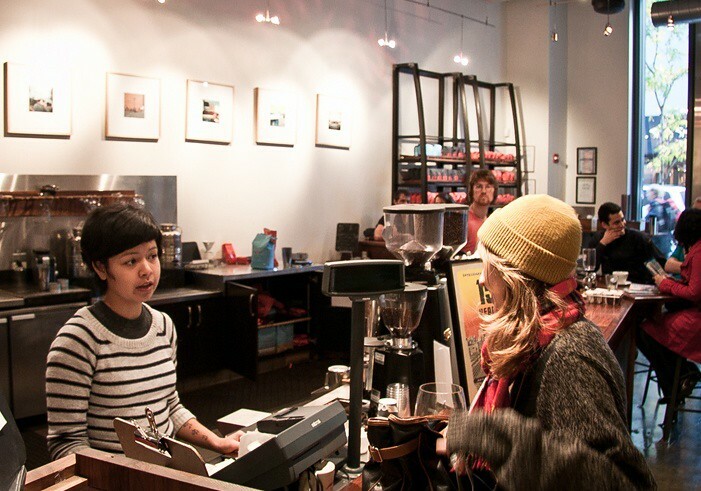 Whenever I hear that a friend is going to visit the Windy City, I make it a point to direct them to one of four locations at Intelligentsia Coffee in Chicago – the place where coffee changed my life.